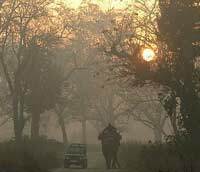 Corbett National Park :- Aptly called the land of roar, trumpet and songs. (120 km) away set on the banks of the mighty Ram Ganga river is Dhikala - the main tourist attraction in the world famous and India's first national Park - Jim Corbett. One can sit in solitude for hours admiring the nature and the river or can go for jeep Safari or Elephant ride for a life thrilling encounter with the Lord of the Jungle - Tiger.The 525 sq.km. of forests and more than 500 species of animals, birds fishes and reptibs provides a range of adventure to all -from a child to a man with his adrenaline pumping. 2 NIGHT / 3 DAYS Accomodation in well appointed A.C Rooms / Cottages/ Suite for a couple. All Buffet Meals for two in restaurant. Fruit basket and Tea / Coffee maker in the room. Romantic candle light dinner with recorded music. Pista Badam Milk and Almondes at night. Evening bonfire at riverside lawn with light music. 20% discount on A-la-carte food. Complimentary cake, once during the stay. (Except Independance day,Dushara, X-Mas & New Year Holidays). TAXES : (i) 5% State Luxury Tax on Room Tariff. (ii) Trade Tax on Food & Beverages as applicable. Above tariff is subject to charge without prior notice. Any increase in government leives will be extra. Driver meal charges Rs.150/- per person per day. Check-in 12.00 noon & Check-out 10.00 a.m.
Full advance by Cheque/ DD in favour of " Nainital Tours & Package." Payable at Nainital at the time of reservation. The Lake District of India - Nainital boasts of Nine different lakes, shares its boundary with one of the most visited National Parks (Corbett National Park) in the country, Has Lush Green Valley view of the Hills and lower forested ridges and obviously is part of the Mighty Glittering Himalayan Range. Mukteshwar has evergreen vistas of exquisite beauty and the sapphire of encircling hill blend with deep blues cloudless skies. These have a charm of their own against the background of great Himalayan peaks glittering in the distance. Mukteshwar is surrounded by beautiful and dense reserve forest of Deodar, Banj, Kharsu, Tilonj, Kafal, Pine, Utis and Mehal. On arrival Pick From Bus Stand arrive to the Hotel & check in to the Hotel. After Breakfast arrive to the Full Day Lake Tour, Then Back to the Hotel Over Night Stay at the Hotel. After Break fast arrive to the Local Sightseeing Kilbury, Himalaya Darshan, Lover's Point, Sucide Point, Water Fall, and Cave Garden. one hour boat ride in NainiTal Lake, and then Back to the hotel. After Breakfast Arrive to the Mukteshwar full day Sightseeing..... then back to the Nainital over Night stay at the hotel.. Lunch And Dinner.once during the stay. One Jeep safari in Corbett National Park. Sita Bani Area. One lake round of row-boat ride on the Naini lake. Half day Lakes Tour by Cab. (Except Independance day, Dushara, X-Mas & New Year Holidays).